The Officer is serving as Director General of the National Disaster Response Force (NDRF), India’s specialized force for responding to natural disasters and CBRN emergencies. 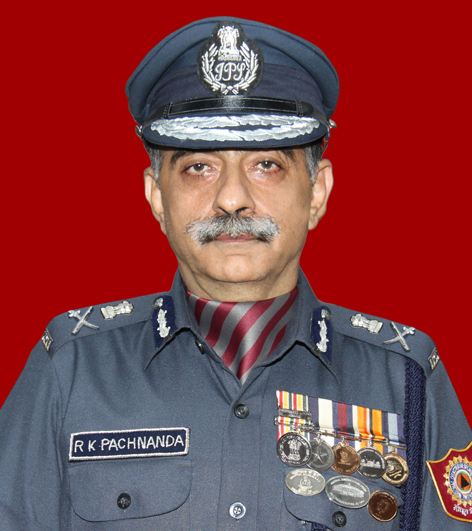 He is an IPS officer of the 1983 Batch. Deputy Commissioner of Police, South Division, Kolkata. President’s Police Medal for Distinguished Service on the occasion of Republic Day 2007. Indian Police Medal for Meritorious Service on the occasion of Republic Day, 1999. Special Commendation from the Prime Minister of India, in 1990, for outstanding work while in the SPG. Commendations for outstanding work in SPG in 1989-90, by Minister of State for Personnel & Pensions, Cabinet Secretary and Director SPG. Commendations by three Directors CBI and DIG CBI for outstanding work/praiseworthy performance in CBI. Represented CBI, India in a symposium on International Terrorism atICPO, Lyon, France in November, 1993. Attended a Seminar on ‘Suicide Terrorism’ in Tel Aviv in January, 2003. Represented India in the Counter Terrorism Programme on Civil-Military Response to Terrorism at Monterey, USA from 19th April to 30th April, 2004. As DIG was the only Police Officer to command the Republic Day Parade in Kolkata (2002) which is always commanded by a Brigadier of the Army. Authored a book “Terrorism and Response to Terrorist Threat”(2002 UBS Publishers’ Distribution Ltd.) which was a best seller. Has written articles on terrorism in the Central Bureau of Investigation (CBI) Bulletin and NPA (National Police Academy) Magazine. (a)Trophies awarded at the National Police Academy, Hyderabad in 1984. (i) IPS Association ‘Sword of Honour’. (iv) Trophy for the “Best Probationer in Drill”. (v) Trophy for the “Best Swimmer’. (vi) The XI Regular (1958) IPS Batch Silver Jubilee L.B. Sewa Memorial Trophy for the ‘Best Probationer in Co-curricular Activities’. (i) Stood First in the Basic Foundation Course, Special Protection Group, beating all other DCIOs and ACIOs. (iii) Stood First in ‘Unarmed Combat’. (iv) Stood First in the Written Test. Ranked India Junior No.3 in Squash (1977). Winner, Chandigarh State Open Men’s Championship (1978-1981). Semi Finalist in the Maharashtra State & Delhi State Championship (1977). Represented St. Stephen’s College Delhi in Squash and Cross Country. Stood First in the Shooting Championship at the Police Sports at Howrah, West Bengal State. Captained the Darjeeling District Revolver Shooting Championship 1987. (4) Represented St. John’s High School, Chandigarh in Hockey and Football (1973 – 1974). (5) Equestrian: Second Prize in the Andhra Pradesh Mounted Show (Hacks Event) in 1984.